"MC thinks there is no merit to the first and some to the second." That is the heart of the issue right there. Most people are up in arms over the first, when the second is the real question that needs to be addressed. I agree with many of your points, particularly about the division in the GOP on the gambling issue. If Pat Anderson is a bad Republican for pursuing free market capitalism in the gaming arena, then so are Haley Barbour (who revitalized the economy of Mississippi through casino gambling and is proud of his record on the issue) and John Kasich (who is pursuing racino legislation in Ohio). Not to mention that in polls, including last year's KSTP/Survey USA poll on the racino issue, over 70% of Republicans in Minnesota favor racino legislation. Where I disagree is with you seeming to give Tony Sutton a pass on the CAGE connection. CAGE is a front group for the tribal casino cartel. Tony Sutton and his wife are on the board of CAGE. We know that hundreds of thousands of dollars have flowed through CAGE"s coffers. We also know that Tony Sutton has a consulting firm. It's interesting to say the least that Tony Sutton did not deny that CAGE was one of his clients. It's absolutely outrageous that any Republican would be on the side of the tribal casino cartel which has given millions of dollars to the DFL in direct contributions and through lobbyist contributions. Last year alone, they gave $1 million in direct contributions to the DFL Party and DFL House and Senate caucuses. Why is our party chairman on the board of an organization funded by entities who pour millions of dollars into DFL coffers? Giving an EXCLUSIVE license to operate slots to ONE rich family is anything but a free-market position but rather the continuation of a government sanctioned monopoly . . . and doing so to fund corporate welfare ala the Vikings and Star Tribune and Canturbury is utterly shameful for a "liberty" person. Note: the Racino legislation that Ms. Anderson et al support (Vikings Lobbyists - clear throat) also has the STATE purchasing the SLOTS for CANTERBURY. Ms. Anderson et al's hypocrisy knows no bounds. As far as Barbour and Kasich? Im assuming an anti-gaming clause was not in their respective state party platforms . . . more importantly they certainly didn't hide their views from the party faithful, unlike Ms. Anderson. There is certainly diversity of opinion vis a vis gaming bewteen MN Republicans. But the Vikings and Canterbury lobbyists' bill is not on the "liberty" side of this debate. 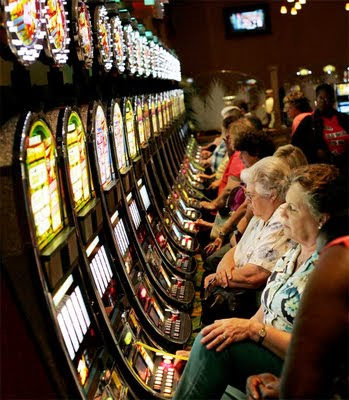 I for instance support full-blown gaming (slots in bars etc), within the confines of local zoning ordinances - Racino bill moves us further away from this. I also support the state getting out of the gaming industry in all forms and manners - the Racino bill buys slots for one family etc . . . This Racino bill is basically just a corporate welfare bill that pads the pockets of Republican lobbyists while subsidizing the Vikings, Star Tribune and Canturbury Downs. Wrong. The Racino bill allows ANY licensed racetrack to add slots (there are two currently in Minnesota). It is not exclusive and is ABSOLUTELY NOT LINKED to a Vikings bill. The many Republican authors on the Racino bill are opposed to a Vikings Stadium. So you need to procure a STATE LICENSE in order to procure another STATE LICENSE to have the STATE PURCHASE slots for you? Ha, yeah, sounds like a free-market bill to me. The extent people go to to rationalize themselves is amusing. Perhaps you can change your bill to include a clause that would return all new gaming revenue to taxpayers if the dough isn't going to feed the beast? You're full of sh@t and you know it. Running Aces doens't count becasue its a joke. This Racino bill should be titled: The Sampson Act. Does the Racino bill only allow select places to have gambling. Yes. Is this anti-free market. In a textbook yes, in the real world, no. Put this way. Based on that logic, the Minnesota Personal Protection Act was Anti-Second Amendment and should have been opposed. It only allows those who get a permit from the state to carry a firearm, and as you know the party position is that we have an individual right and don't need any permission. So would the correct thing be that anyone who voted for the act be throw out of position, and of course anyone who is supporting Rep. Cornish Castle Doctrine should also be banned, sine this are not pure positions but compromise. It is at this point that the adults show up and say that sometimes in politics it is better to move the ball down the field and get a first down then to always be throwing for the endzone. The Sampson Act...hmmm. Did you know that Canterbury is a public company which means you can buy shares in the company? Probably not; but why would you want to include pertinent facts in your tirade...it doesn't sell your story! BTW - do you have the word 'stupid' written on your forehead??? I'll say it again. If the legislature chooses to take the libertarian position that folks can gamble, or offer venues for others to do so, I still think they're wrong, but at least they're following some principle. But if one thin dime of that goes into the State government's coffers, then I've got a problem with it, because nobody in their right mind should want to give more money to a government that cannot live within its current means. Doing ANYTHING as a "revenue enhancement" ought to be contrary to every conservative's fundamental principles, at least until all unnecessary and inefficient spending is eliminated (on that magical day). Thank you MC for bringing all these issues out into the open! It reminds me of that saying: remember there are three fingers pointing back at you when you point a finger at someone. Who is the majority shareholder of the publicly traded Canterbury? Again, "The Sampson Act" seems an apt name for the bill. And yes, perhaps I have the word "stupid" written on my forehead - I haven't looked in mirror yet. But I can assure you I don't have the word "hypocrit" sullying my soul. Your analogy to gun licenses is laugable - but I guess thats what you folks get paid to peddle. So now that the Assistant Senate Majority leader has come out with a proposal for a Casino that is unambiguously in violation of the Party Platform since it proposes a new Casino in Block E. I assume that Brodkorb will be hitting all the media outlets asking for him to resign - Or will those holding his purse stings muzzle him? I,Jack Shepard am the only game in towm. So if you wish the miracle of beating Amy Klobuchar TKO in her primary: Talk it up and keep spreading the word. Beacuse then without Amy's name on the General Election ballot she will have to spend millions of her $5,000,000 on damage control and election of a GOP Conservative junior U.S. Senate will be a real possiblity, a Senator wil protect the lives of Minnesota's unborn babies and maybe be that senator who get the magic 51 GOP US Senators. to get our agenda passed- talk it up I am the only game in town to eliminate Klobuchar so a Conservativ could be elected as Minnesoat's next junior Senators in the Nov 2012 elections. You have touched the vital nerve, i must say. I agree with you. The problem of gambling can only be avoided if you are trying to be some more cautious and taking your steps with precautions.